12" x 11" x 17.5"
Members of Bekarum, a male hunters' association of the Boki culture, create skin-covered crest masks for entertaining, celebratory masquerades. The masks are trophy heads fashioned by skinning the kill and stretching its skin over a wooden form, then polishing it with palm oil. White clay colors the teeth, and ground tree bark serves as black pigment. 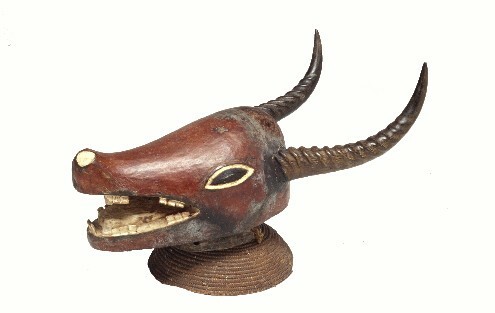 This mask also incorporates an antelope's horns. The mask is affixed to a basket and tied onto the dancer's head. The basket seen on this mask is somewhat uncharacteristic (most of such basket types also include a narrow brim at the bottom). To further disguise the dancer, his face and body are covered with netting. In other neighboring cultures, human head-type masks are created in this manner and are used in war dances, initiations and funerals. Bibliography: Nicklin, 1974, pp.8-15, 67-68, 92.